Foreign Policy Speech In Gettysburg, Pa.
By Bill McCarthy on Friday, July 13th, 2018 at 1:13 p.m. The Justice Department has rekindled its efforts to thwart AT&T's blockbuster deal with Time Warner. The department filed a notice of appeal July 11, 2018. The $85 billion mega-merger was finalized a month ago after a federal judge ruled that it would not substantially reduce market competition. The department previously decided not to seek an injunction to block the merger, but it had 60 days from the date of the ruling to file an appeal. AT&T CEO and chairman Randall Stephenson said the move "doesn't change anything" because the transaction is already closed. The Justice Department's antitrust division sued last year to block the merger on the grounds that it would give AT&T, which distributes content through its subsidiary satellite television provider DirecTV, an unfair advantage over other companies that also distribute content. The DOJ said AT&T would be able to charge rival distributors more for Time Warner content, which could result in increased prices for consumers. AT&T and Time Warner argued that the video programming and distribution market was in the midst of a revolution, and that they needed to combine content creation with distribution in order to keep up with internet-age tech companies such as Google, Facebook, Amazon, Hulu and Netflix. Now, the case will be taken up by the D.C. Circuit Court of Appeals. Should it reach the Supreme Court, which has not considered a merger case since the 1970s, any decision would become binding as precedent. Since the merger's completion, AT&T has made Time Warner a separate division from the rest of the company and renamed it WarnerMedia. The company has also raised prices for DirectTV customers, despite arguing in court that the merger would not trigger price hikes. U.S. District Court Judge Richard Leon warned against an appeal in his decision, writing, "As my 170-plus page opinion makes clear — I do not believe that the government has a likelihood of success on the merits of an appeal." President Donald Trump's vow to block the deal is down to its final option. Absent a reversal of the merger, we will continue to rate this Promise Broken. By Bill McCarthy on Tuesday, July 10th, 2018 at 1:02 p.m.
AT&T officially completed its merger with Time Warner on June 14, 2018, finalizing the $85 billion deal just two days after a federal judge approved it, according to a press release. "We're going to bring a fresh approach to how the media and entertainment industry works for consumers, content creators, distributors and advertisers," said AT&T CEO and chairman Randall Stephenson in a statement announcing the merger's completion. The move came shortly after the Justice Department said it would not seek an injunction to stop the deal. On June 12, 2018, U.S. District Court Judge Richard Leon rejected the DOJ's assertion that the merger would substantially reduce competition. AT&T and Time Warner had until the agreement's expiration on June 21, 2018, to complete the merger. An injunction could have delayed the merger beyond this deadline, effectively terminating it. Although the DOJ decided not to seek a stay of the court's decision, it has 60 days from the date of the ruling to file an appeal. The merger's completion did not eliminate this option. Reports from the Washington Post and the New York Times said the DOJ is still evaluating whether to issue an appeal. For our last update, we spoke with Eleanor Fox, professor of trade regulation at the New York University School of Law and an expert in antitrust law, who told us there was "virtually no chance of the DOJ winning an appeal" because the decision was made on the basis of irreversible facts. "The role of fact-finding is for the judge of the trial court, and this was the trial court's decision," Fox said. "Unless there was a serious error made in the fact-finding, the appellate court cannot overturn the finding." The merger's completion marks a setback for President Donald Trump, who promised to block the deal during a campaign speech on Oct. 22, 2016. "As an example of the power structure I'm fighting, AT&T is buying Time Warner and thus CNN, a deal we will not approve in my administration because it's too much concentration of power in the hands of too few," Trump said. We will update this promise if the DOJ pursues an appeal before the end of the 60-day window, or if the circumstances surrounding the merger dramatically change. For now, the merger is complete, so we rate this Promise Broken. 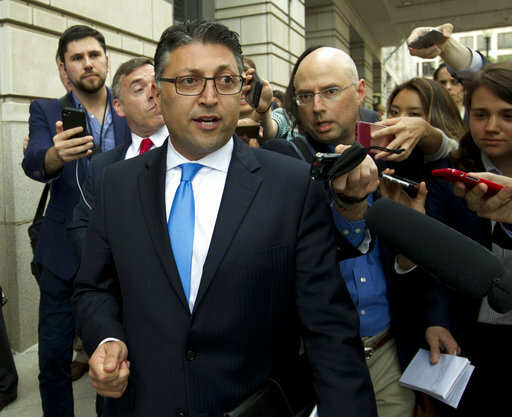 Assistant Attorney General for Antitrust Makan Delrahim leaves the federal courthouse Tuesday, June 12, 2018, in Washington (AP Photo/Jose Luis Magana). By Bill McCarthy on Thursday, June 14th, 2018 at 10:20 a.m.
A federal judge on June 12, 2018, approved the $85 billion merger between AT&T and Time Warner, rejecting the Department of Justice's assertion that the deal would substantially reduce market competition. U.S. District Court Judge Richard Leon said the DOJ did not prove that AT&T's acquisition of Time Warner would raise prices for television and internet services and limit consumer choice options in a way that would be "likely to lessen competition substantially." He did not impose conditions on the merger. "If there ever were an antitrust case where the parties had a dramatically different assessment of the current state of the relevant market and a fundamentally different vision of its future development, this is the one," Leon wrote in his 172-page opinion. The DOJ's antitrust chief, Assistant Attorney General Makan Delrahim, sued last year to block the merger on the grounds that it would give AT&T, which distributes content through its subsidiary satellite television provider DirecTV, an unfair advantage over other companies that also distribute content. The DOJ said AT&T would be able to to charge rival distributors more for Time Warner content, which would likely result in increased prices for consumers. AT&T and Time Warner argued that the video programming and distribution market was experiencing a revolution, and that they would need to combine content creation with distribution in order to catch up to internet-age technology giants such as Google, Facebook, Amazon, Hulu and Netflix. AT&T general counsel David McAtee said after the ruling that the company would look to finalize the merger before June 20. The DOJ has not yet announced whether it will appeal the decision. The merger would serve a major blow to President Donald Trump, who assured supporters that he would not allow it during an Oct. 22, 2016, campaign speech. "As an example of the power structure I'm fighting, AT&T is buying Time Warner and thus CNN, a deal we will not approve in my administration because it's too much concentration of power in the hands of too few," Trump said. The ruling, however, was largely out of Trump's hands. Trump does not have the authority to approve or deny mergers. "It was a promise he had no business making," said Eleanor Fox, professor of trade regulation at the New York University School of Law and an expert in antitrust law. "This is for the courts, not the president." He can, however, appoint people to departments in charge of mergers, and he put Delrahim in charge of the DOJ's antitrust division. But Delrahim swore to the court that he was not influenced by the White House, and Leon halted the companies from introducing evidence concerning potential political intervention. The government could seek a stay of the court's decision to suspend the merger while the case travels through the appeals process. Leon took the unusual step when issuing his decision of urging the government not to seek a stay. He said a stay request would be "manifestly unjust" because the merger agreement is set to expire June 21 and a stay would essentially force this expiration. The DOJ could also appeal the decision without seeking an injunction, but that would leave open the possibility that AT&T and Time Warner could complete the merger before the appeals process concluded. DOJ spokesman Jeremy Edwards declined to comment on the government's intentions, pointing instead to a statement issued June 12, 2018, in which Delrahim said the DOJ was disappointed. "We continue to believe that the pay-TV market will be less competitive and less innovative as a result of the proposed merger between AT&T and Time Warner," Delrahim said. "We will closely review the Court's opinion and consider next steps in light of our commitment to preserving competition for the benefit of American consumers." Fox said there is "virtually no chance of the DOJ winning an appeal" should it seek one, because the decision was rendered on the basis of facts that cannot be reversed. "The role of fact-finding is for the judge of the trial court, and this was the trial court's decision," she said. "Unless there was a serious error made in the fact-finding, the appellate court cannot overturn the finding." Until we see what the DOJ decides to do next, we will rate this promise Stalled. By Allison Colburn on Monday, November 20th, 2017 at 5:22 p.m. The U.S. Justice Department is suing to block AT&T's $85 billion merger with Time Warner. David McAtee, senior executive vice president and general counsel for AT&T Inc., confirmed the suit in a Nov. 20 statement. "Today's DOJ lawsuit is a radical and inexplicable departure from decades of antitrust precedent," McAtee said. "Vertical mergers like this one are routinely approved because they benefit consumers without removing any competitor from the market. We see no legitimate reason for our merger to be treated differently." The suit comes weeks after news reports said the deal was stumbling. The Wall Street Journal, citing unnamed sources familiar with the matter, first reported on Nov. 2 that the Justice Department might sue to block the merger if the department can't come to an agreement with the two companies. Multiple news outlets, including Bloomberg, the New York Times, CNBC and the Los Angeles Times, also reported that the Justice Department is asking AT&T to sell certain assets to alleviate some of the department's antitrust concerns. In particular, negotiations focused on selling either DirectTV or Turner Broadcasting, which owns several network television stations, including CNN. PolitiFact does not use reporting from anonymous sources. But news on the deal has prompted criticism from people who believe President Donald Trump is influencing the department's dealings on the matter, given his rhetoric on the campaign. "As an example of the power structure I'm fighting, AT&T is buying Time Warner and thus CNN, a deal we will not approve in my administration because it's too much concentration of power in the hands of too few," Trump said in an Oct. 22, 2016 speech. Presidents cannot deny or approve mergers, but they can appoint people to departments that oversee them. Trump's nominee for assistant attorney general for the Justice Department's antitrust division, Makan Delrahim, was approved by the Senate in September. When the New York Times recently asked Delrahim about comments he had made a year ago in which he said the merger is not a major antitrust problem, Delrahim said those comments were taken out of context. When asked about the merger during his November trip to Asia, Trump said the deal might end up in litigation. Before the lawsuit was announced, AT&T was planning to look into whether the White House had any influence or involvement by seeking communications records between the White House and the department, according to Bloomberg. Sen. Amy Klobuchar, D-Minn., along with other Senate Democrats, wrote letters to both Trump and Delrahim in which they asked if there have been communications between them on the matter. When we asked about any communications, the Justice Department and the White House pointed to recent statements from Delrahim and White House spokesman Raj Shah, who both denied discussions on the merger took place. AT&T has hired a lawyer, Daniel Petrocelli, to serve as lead trial counsel in the case that the Justice Department sues. Petrocelli has represented Time Warner and Walt Disney in the past, and last year he represented Trump in lawsuits related to Trump University. "Fortunately, the Department of Justice doesn't have the final say in this matter," McAtee said. "Rather, it bears the burden of proving to the U.S. District Court that the transaction violates the law. We are confident that the court will reject the Government's claims and permit this merger under longstanding legal precedent." Until we see some resolution on the deal, we'll rate this In the Works.